Small game made for Archaeology (Bitsy Jam). 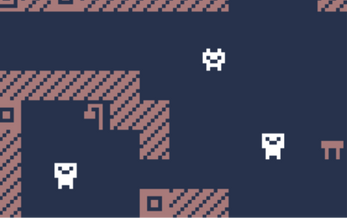 My first time using Bitsy. It was quite fun! Simply walk around using the arrow keys. You can interact with anything which is the same colour as your character. I still love these kinds of game I used to play at Atari 800XL when I was kid :). Cool game! This is so charming! I love the way you used the dig zones. Great colours, great gameplay, great music... Good job!